This time out, Kastning (30-string contra-alto guitar, 36-string double contra guitar, and piano) approaches the improvised sounding compositional work as a trio, along with Sándor Szabó (electric guitar and baritone electric guitar) and Balász Major (drums, percussion), both of the latter from Vác, Hungary. The recordings were done both at Traumwald studios in Massachusetts and at Tandem Studios in Vác, although the specifics of what was done where are not clear. Anyway, it doesn’t matter – with a load of effects and two studios in play, much can be achieved in a dreamy and sparse musical environment that these three musicians masterfully create. 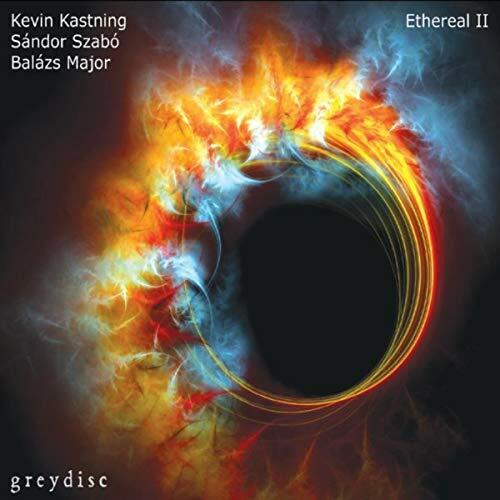 Ethereal I (from earlier in 2018) featured only Kastning and Szabó; here Major contributes his spacy percussion and drums, which, evolving out of a similar root idea as its predecessor, adds an entire new dimension to the sound, although Major isn’t keeping any kind of steady beat, he is in full improvisational mode as well, which still gives Szabó and Kastning their freedom and purely creative space. All three musicians have created together many times before, mostly Kastning and one of the others, but the last time all three worked together in the same space was on the 2013 album Becoming, but don’t use that as a strict reference, as the two are quite different; each piece in this puzzle is unique, taking its own path through an unconventional melodic maze. “Hollow Sky” is subtle on the percussion, but both guitarists are taking advantage of that space, with Kastning paining a rainbow of colors in the background, while Szabó plays kaleidoscopic melodies affected by stunning flashes of reverb and subtle echoes out front. “Portals I” and “Portals II” account for a full album side of twisty turny melodic meandering with just enough percussion (mostly hand drums) to keep it all fluid and interesting for the duration. Throughout all the album’s nine tracks, much attention is given to space, so you never get a condition where too much sonic density ruins a beautiful view into the soul of the three musicians as they create. Of course not, these three have recorded together numerous times prior and know exactly what they are doing.